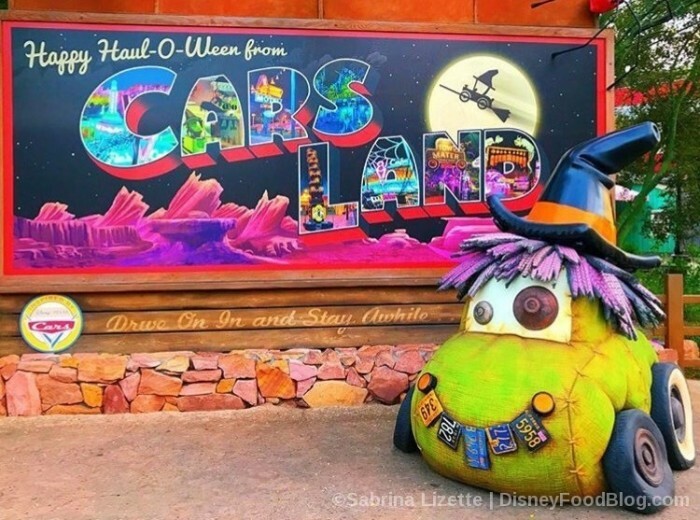 The Halloween-ization of Cars Land is just… well, look for yourself. So much neon. So much spook. And it doesn’t end with colorful signs and bright up-lighting. Oh, no. Mater is totally in on the action. 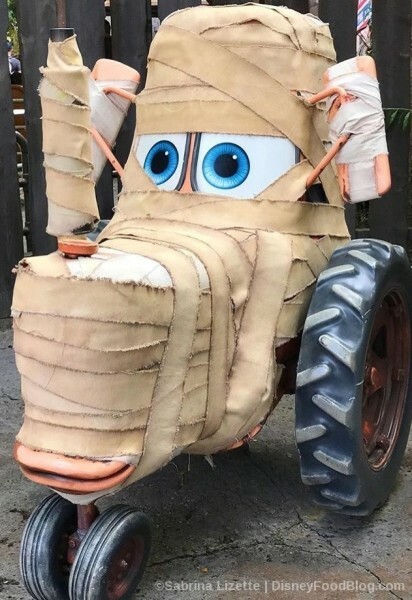 If you’ve seen Mater’s Tall Tales, you know he can pull off some looks. 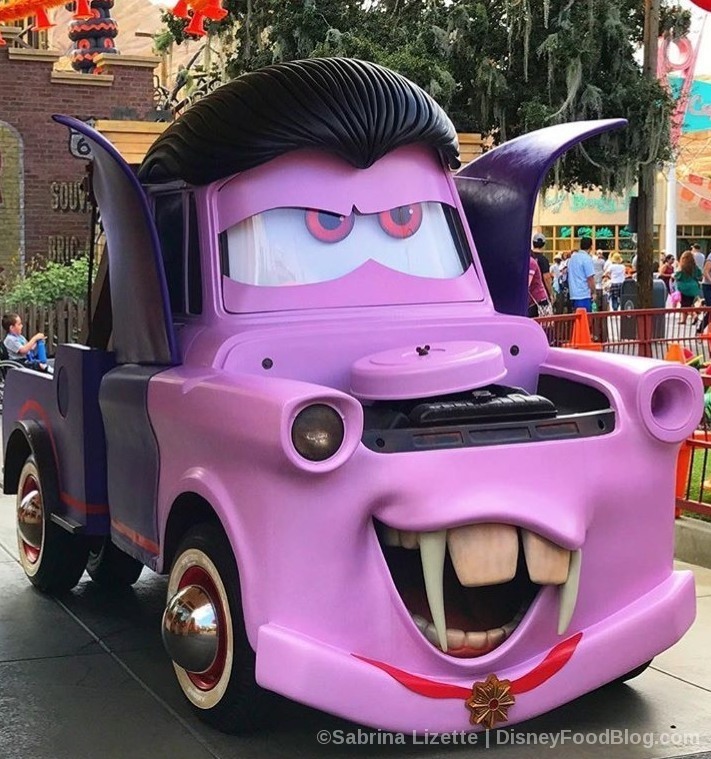 But THIS is a new one: VAMP-MATER! Vamp-Mater is the best Mater. Even the tractors got some love, all wrapped up like mummies. Cars Land has always been a mecca for incredible screen-to-real-life design, but this shows a whole new level of creativity. While we’re in Cars Land, we gotta check out some souvenirs and eats. Because our dear pals Sabrina (@EverythingDisney.55) and Heather (@DiningInDisney) really went above and beyond to capture all this Halloween magic! First up: Spooky Traffic Cone Bottles. 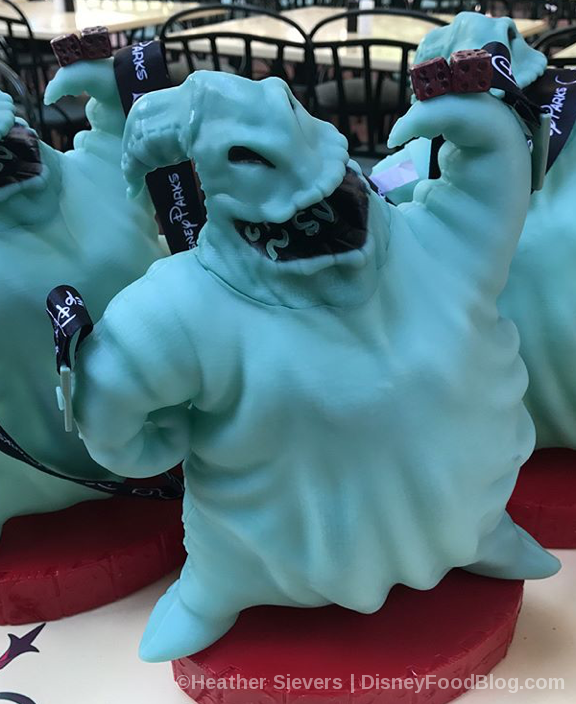 They might not be the most practical souvenir cups we’ve ever seen, but they just might be the most original! 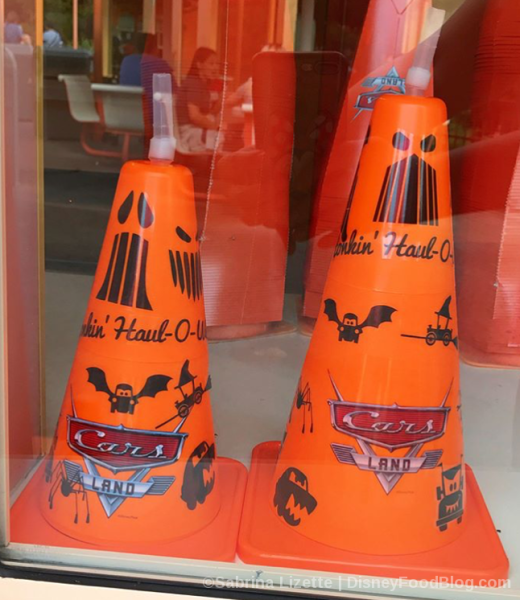 Of course, Cars Land doesn’t stop there with the traffic cone motif. 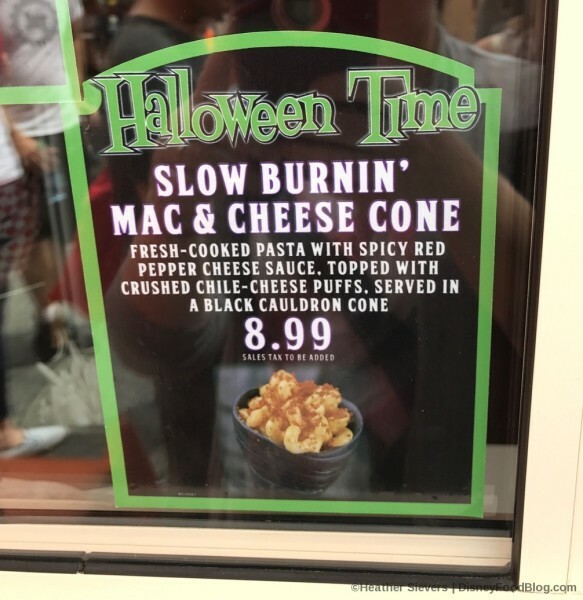 You can also find one of the most hotly anticipated savory snacks of the Halloween season: the Slow Burnin’ Mac and Cheese Cone. 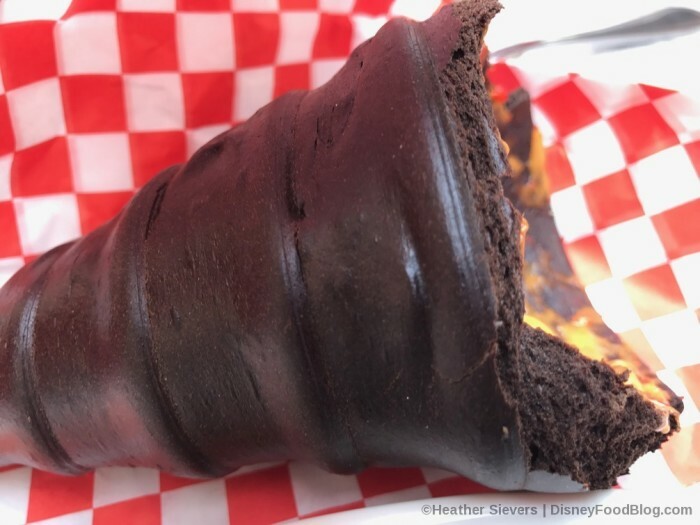 This is one in a line of many bread cones served up at the Cozy Cone Motel, but this is the ONLY one served up in a “black cauldron cone”. Heather hypothesizes that this cauldron is pumpernickel bread, which explains the dark colored dough. But pumpernickel isn’t Heather’s jam, so this wasn’t a win for her. 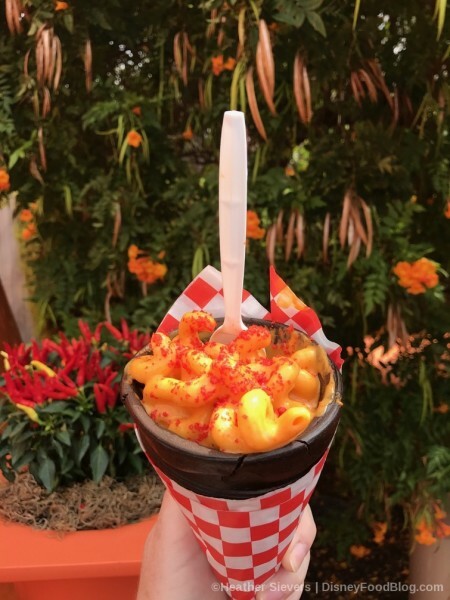 Inside this cauldron is macaroni in a spicy red pepper cheese sauce. It’s definitely got a fiery hue. And Heather reports that it is, indeed, spicy, which is great if you love heat. 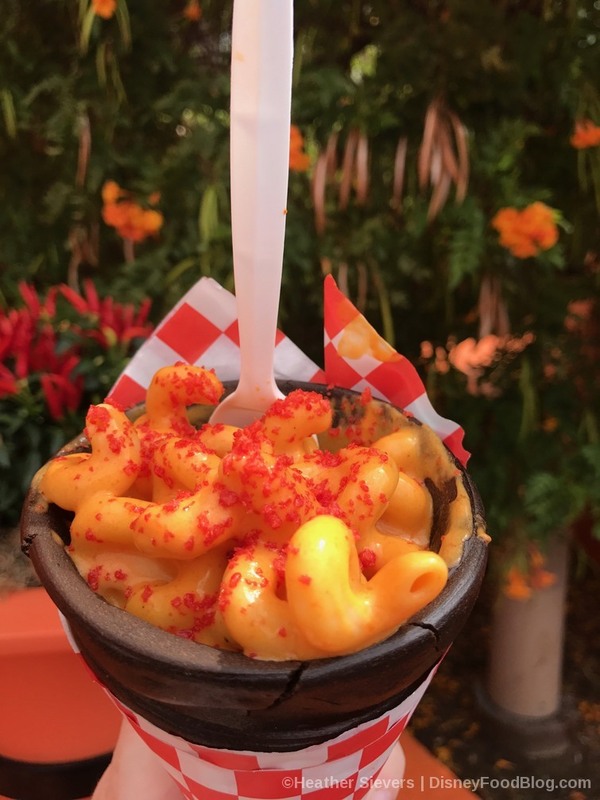 The bright red topping is crushed red chile-cheese puffs (which are basically screamin’ hot Cheetos!). They add a little textural interest, but just there’s not much of it on there. Gimme more, please! Overall, the Slow Burnin’ Mac and Cheese Cone was just okay, which is a bummer because it had so much potential! But! 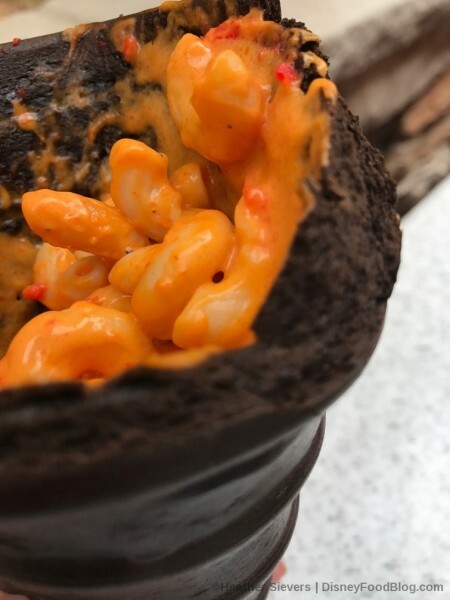 Cars Land has another cone-related snack: the Spoke-y Cone Macaron. Those eyes are pretty intimidating, but fear not! 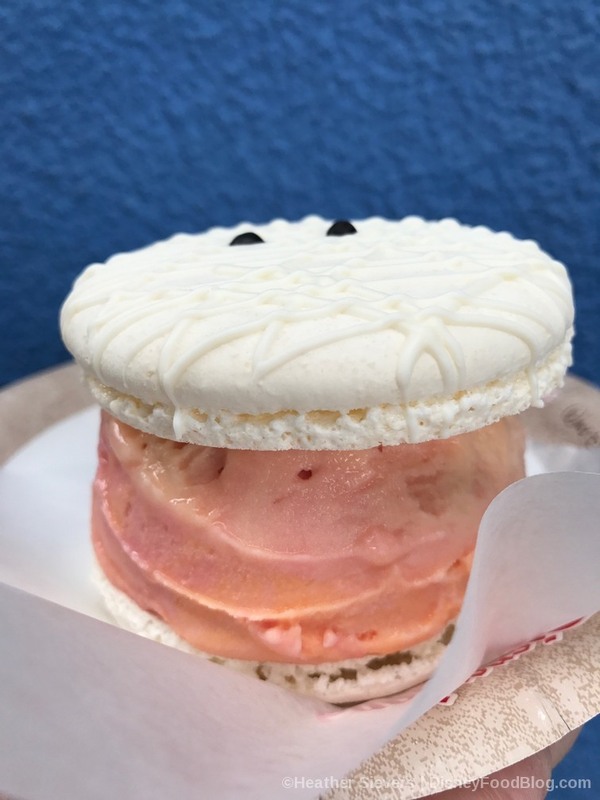 The Spoke-y Cone is really just an orange-colored macaron. But that’s not all there is to it. 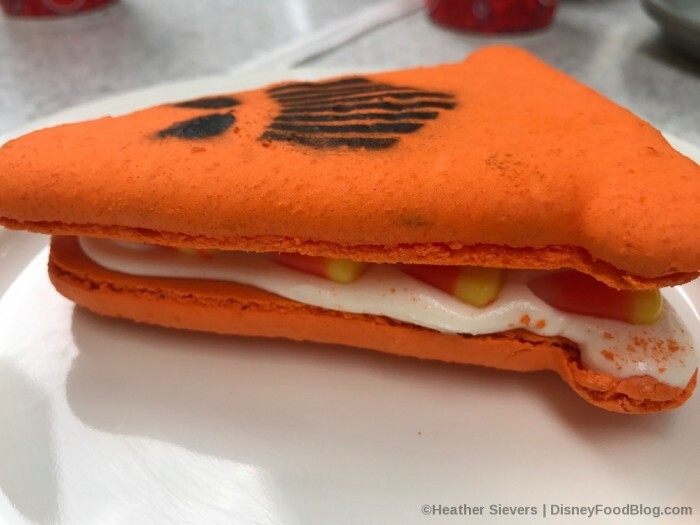 Tucked inside are several candy corns and marshmallow buttercream — so you candy corn fans, this one is DEFINITELY for you! 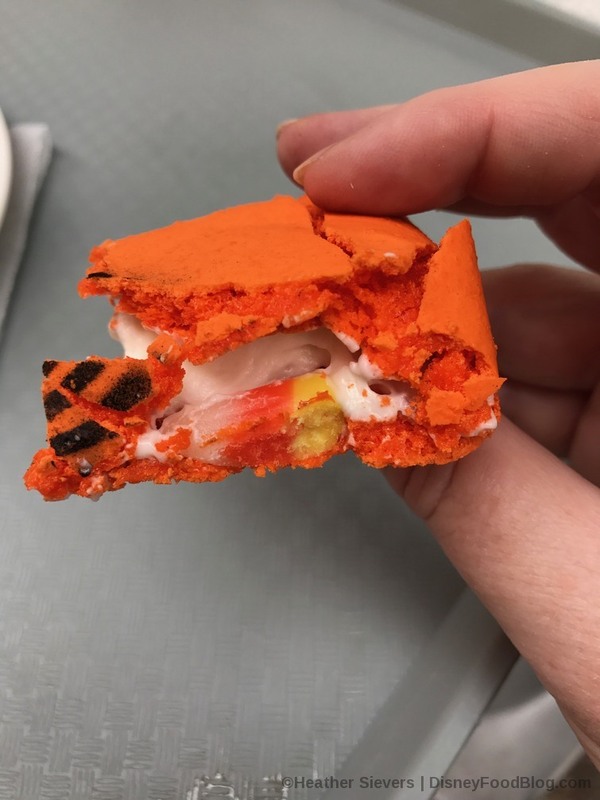 Like every good macaron, this one has a crisp outside and a delicate, melt-in-your-mouth inside that crumbles deliciously when you eat it. Before you check out of the Cozy Cone Motel, you’ll want to pick up a cone of Junkyard Jambooree Mix! 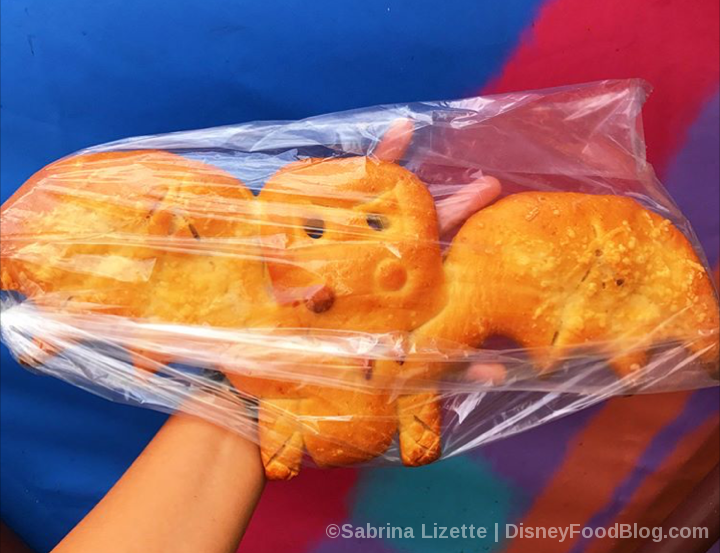 This is basically a salty-sweet snack fan’s dream come true! 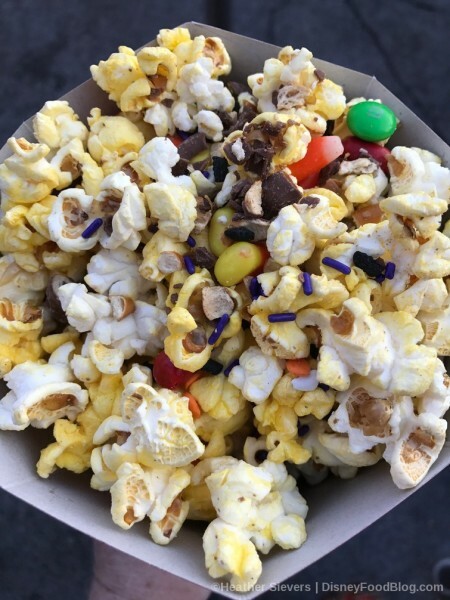 You choose the popcorn flavor you prefer, and the cast member will top it off with a ton of awesome sweet stuff! 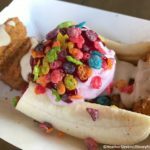 Cone of popcorn with candy! 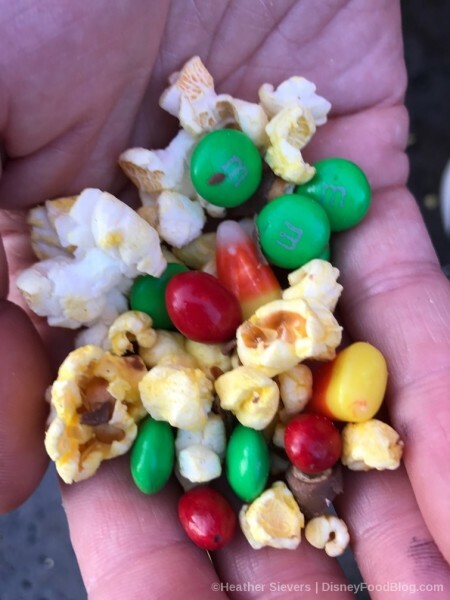 Heather chose traditional butter popcorn, which was a great foundation for Green M&Ms, Candy Corn, Chocolate-Covered Pretzels, Boston Baked Beans, and Ghost Quins. Before you ask, Boston Baked Beans are chocolate-covered peanuts. 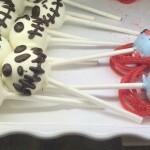 And Heather’s pretty sure the ‘Ghost Quins’ are the purple sprinkles. So much deliciousness in a single handful! 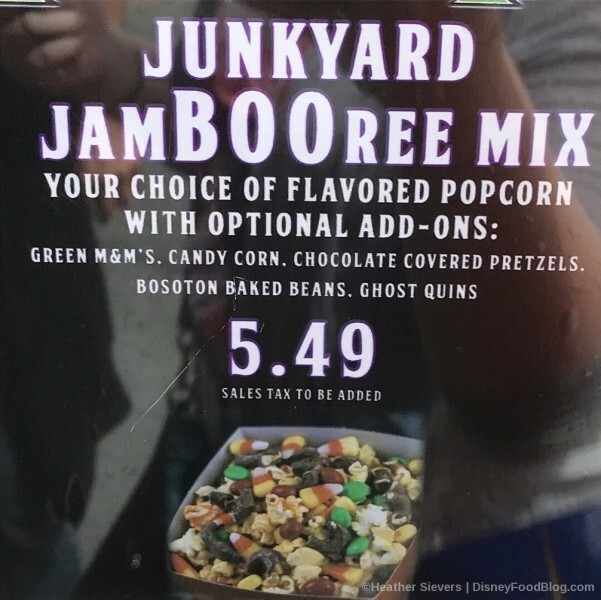 Handful of Junkyard JamBOOree Mix! This is a traditional chicken pot pie, but the inclusion of dried cranberries cranks up the autumn theme a bit. Of course, the awesome CAR-achnid on the top also helps to set the mood. 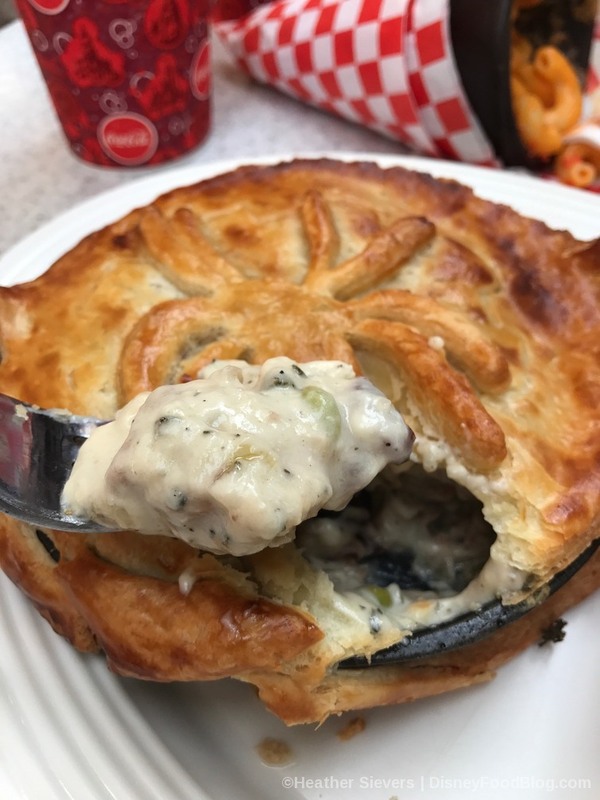 You’ll want to see that butter crust up close. 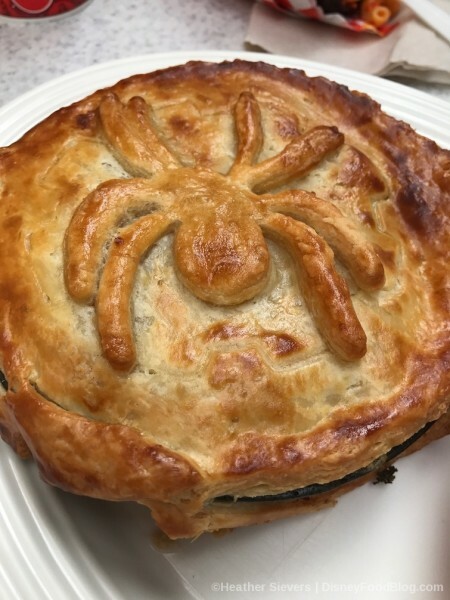 It’s beautifully golden brown with an eight-legged friend perched on top. 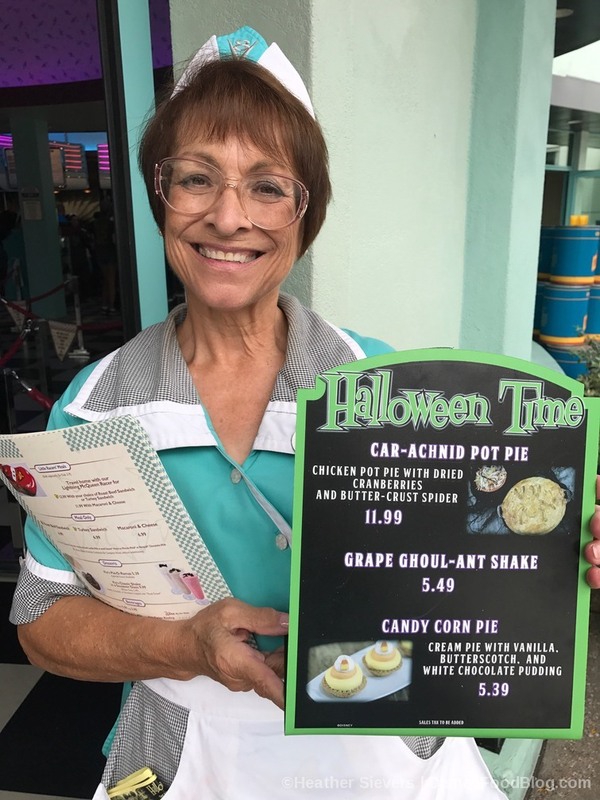 This was Heather’s FAVORITE ITEM OF THE DAY — and that’s really saying something once you see what else makes up this list! If you find yourself hungry for some savory comfort food in Cars Land, go get this! 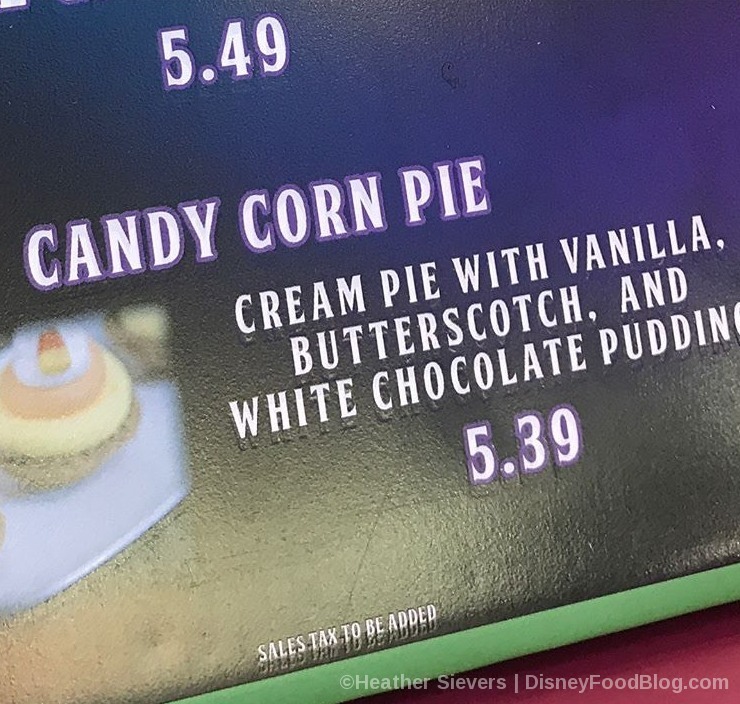 Also available at Flo’s is something called Candy Corn Pie. 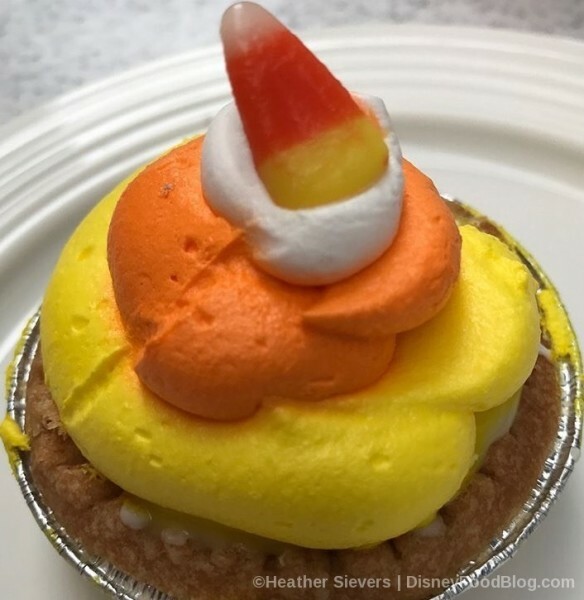 This super sweet cream pie is topped with vanilla, butterscotch, and chocolate pudding, layered to resemble the classic Halloween candy staple. 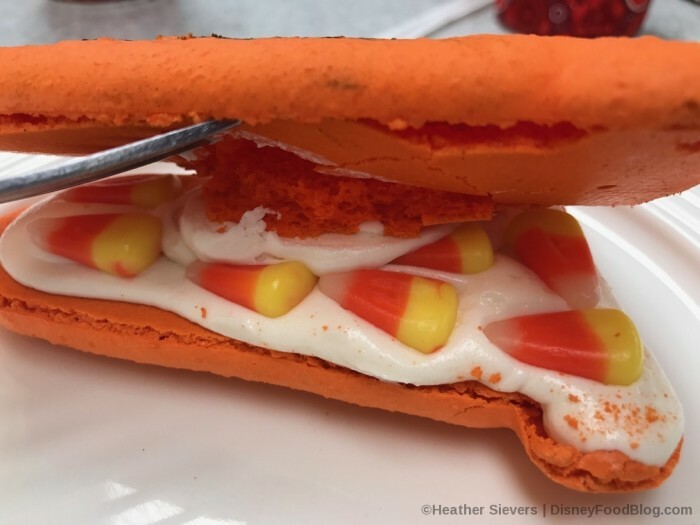 It’s topped off with a single candy corn which, well, gives you a little scale on this one. Heather says it’s good — but that it’s tiny for the price. Probably want to steer clear of this if you’re trying to get the most bang for your buck. But if you love all things creamy and candy corn-y, this could be a big hit for you! 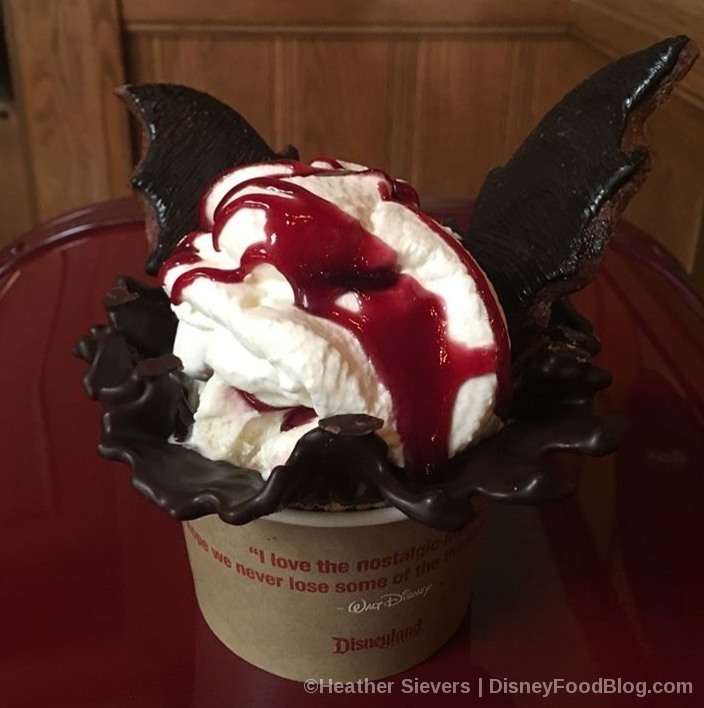 Clarabelle’s Hand-Scooped Ice Cream is getting in on the act with two uber-creepy sweet treats. 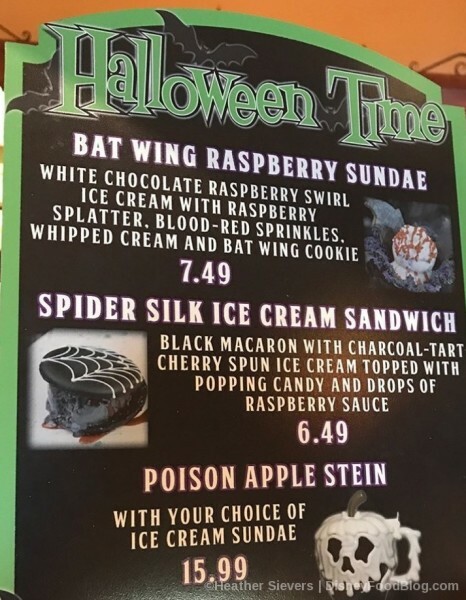 The Bat Wing Raspberry Sundae starts with a base of White Chocolate/Raspberry Swirl Ice Cream and adds Raspberry Splatter (! 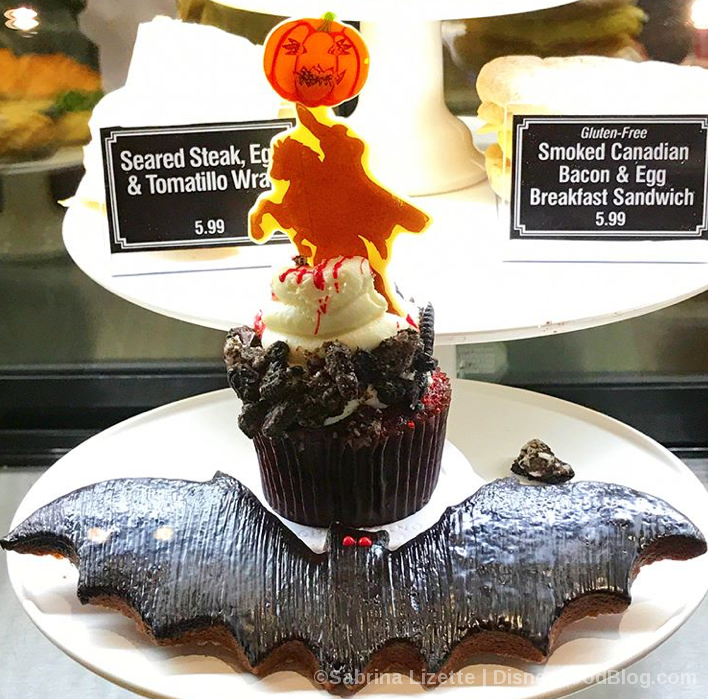 ), Blood Red Sprinkles, Whipped Cream, and a Bat Wing Cookie. 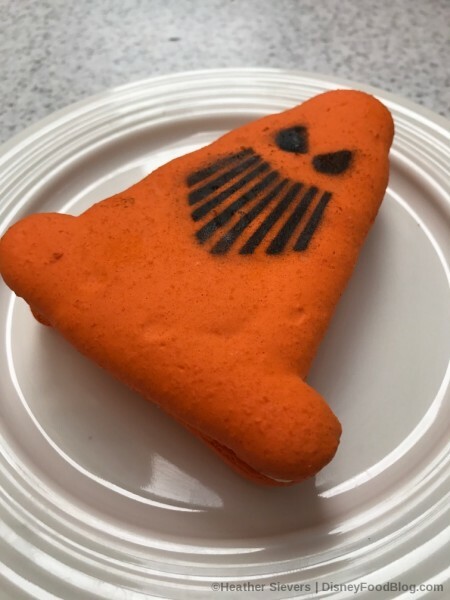 The cookie is chocolate with a chocolate glaze, and it goes really well with the raspberry flavors. Heather’s didn’t get the blood red sprinkle treatment, sadly. That red splatter though! Clarabelle’s second treat is equally Halloween-y: the Spider Silk Ice Cream Sandwich. 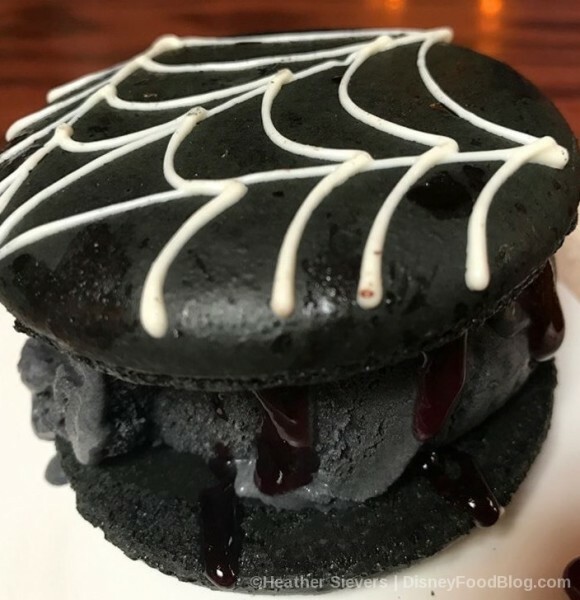 This is a large black Macaron stuffed with a huge scoop of Charcoal/Tart Cherry Spun Ice Cream. The sandwich is then topped with Popping Candy (Heather’s was M.I.A., unfortunately) and Raspberry Drops. The combination of macaron and ice cream is a cool textural contrast, and the flavors were good. Little PSA on this one: It will turn your mouth black. You’ve been forewarned. Heather reports that it’s as hefty as the description seems. And while it was tasty, she advises sharing with at least one other person. 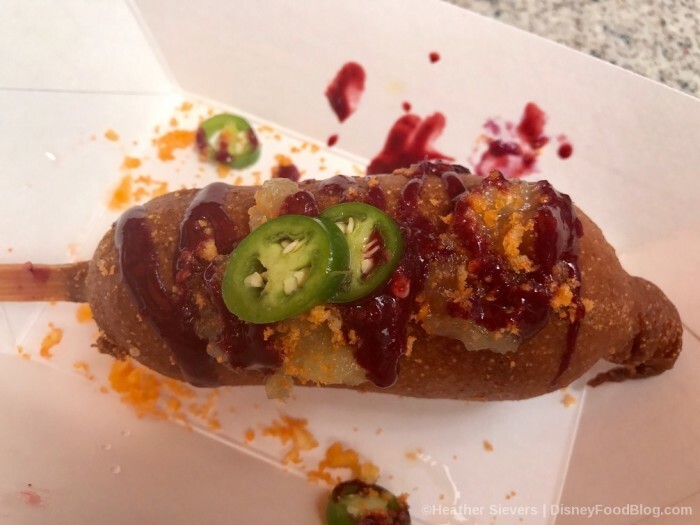 The blackberry sauce is a sweet foil to the savory cheese stick and spicy peppers. And the pineapple salsa is pretty unexpected — but it’s good! And Heather was very happy to find that the cheese stick inside had melted. 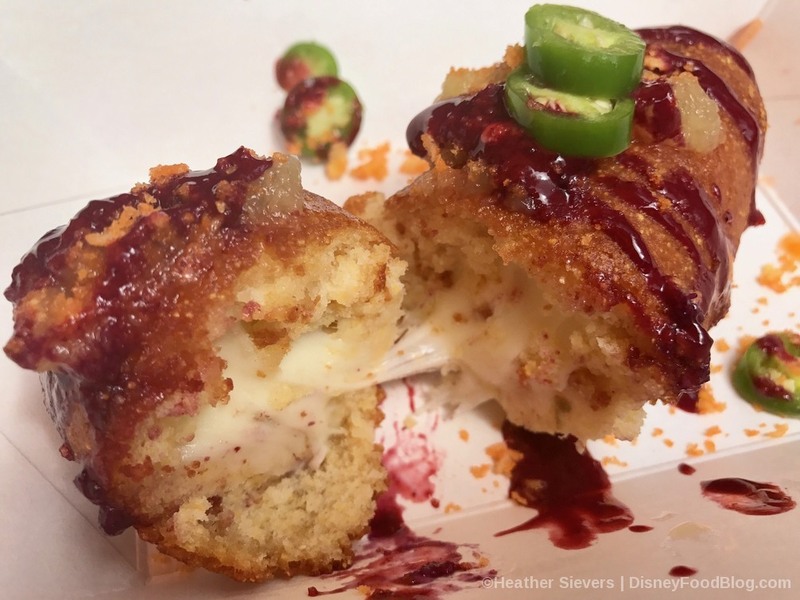 That’s a must if we’re deep frying cheese sticks, but it doesn’t always happen. So this is a winner! 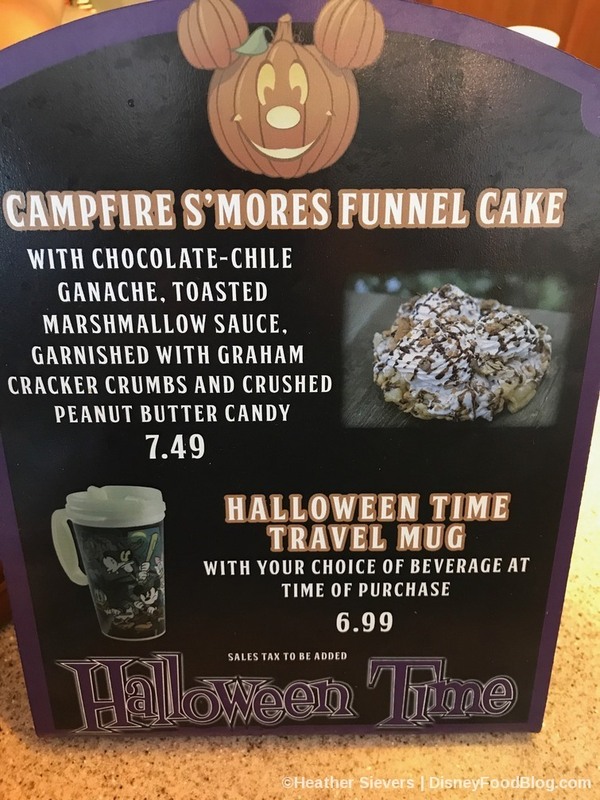 Meanwhile, at Schmoozies (also located in California Adventure) you can pick up two decided Halloween-y and adorable sweets! 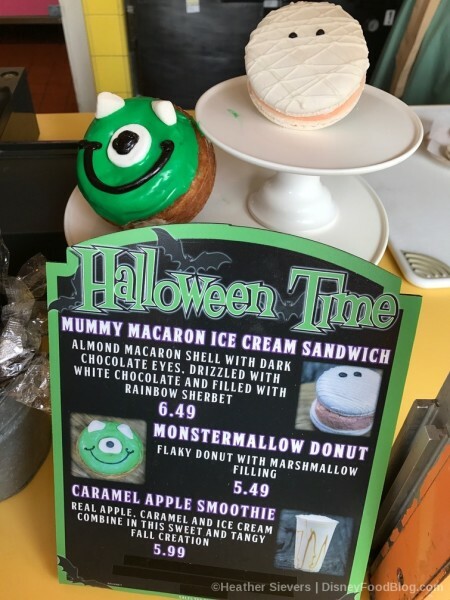 The Monstermallow Donut has a decidedly Mike Wazowski-like countenance, while the Mummy Macaron Ice Cream Sandwich is simply perfect. 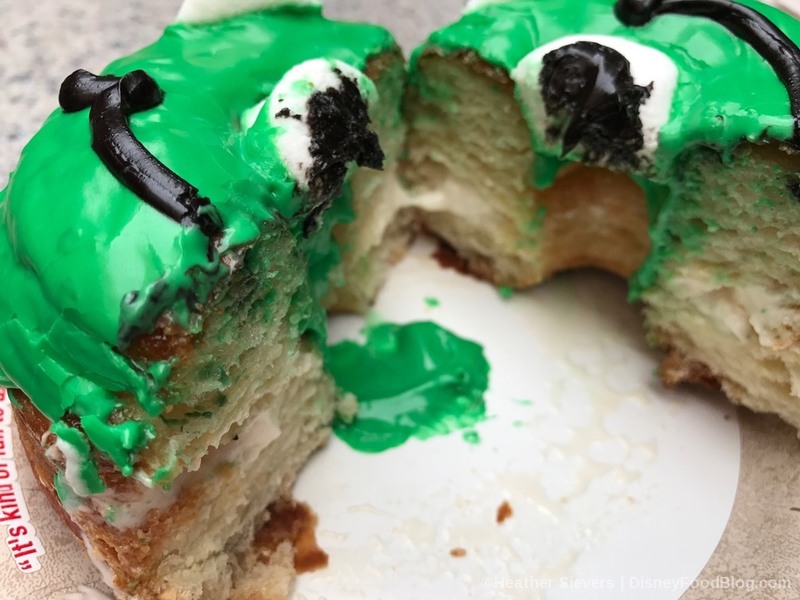 The Monstermallow Donut is seriously bright green, but those marshmallow horns and eye are great. We even love his crooked smile. And inside? 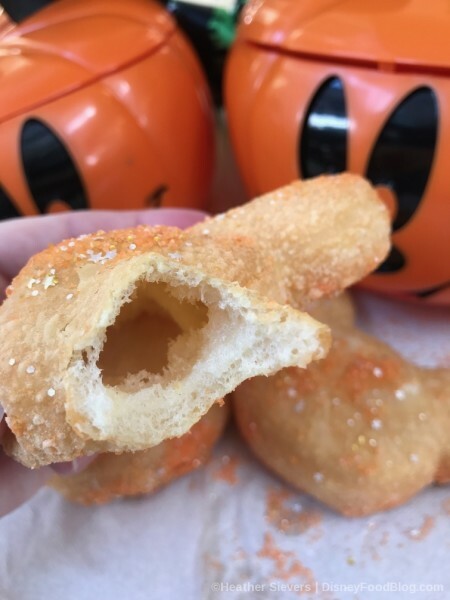 Well, friends, this donut is actually a CRO-nut, so you’ll find delicious layers of fried dough and a filling of marshmallow cream. Yum! 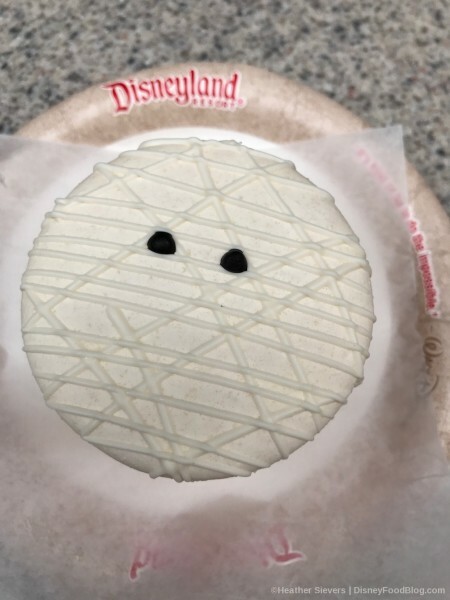 The Mummy Macaron Ice Cream Sandwich is a large plain white macaron with dark chocolate eyes and white chocolate drizzle (the wrapping on the mummy, of course!). 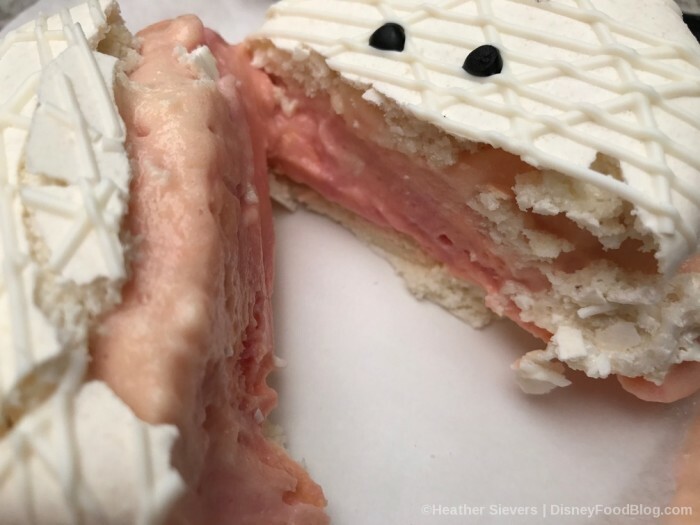 And while the top view is cute and simple and pretty nondescript, this macaron is filled — really! — with a giant scoop of rainbow sherbet. Whoa! Lots of rainbow sherbet! It’s a hard on to eat. Heather actually grabbed a fork to help navigate. But it’s totally worth the effort! Heather also tried Cheeseburger Pizza, available at Disneyland’s Boardwalk Pizza & Pasta! Heather went into this one with low expectations — but she was pleasantly surprised! 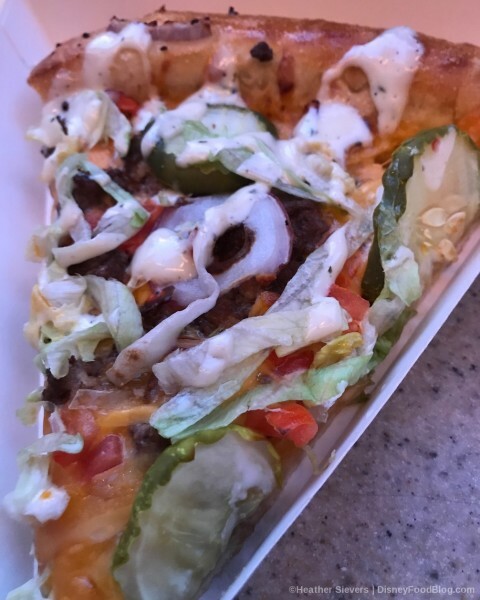 Cheeseburger Pizza is just what it should be: a slice of pizza with nearly every cheeseburger component! 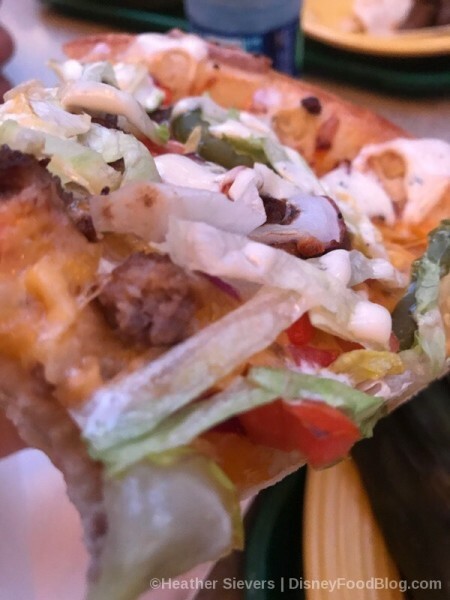 Those tasty components include ground beef crumbles, cheddar cheese, dill pickle slices, shredded lettuce, diced tomatoes, slices of red onion, and a drizzle of ranch dressing (in lieu, we assume, of mayo!). If you like these toppings, you’ll love this pizza! 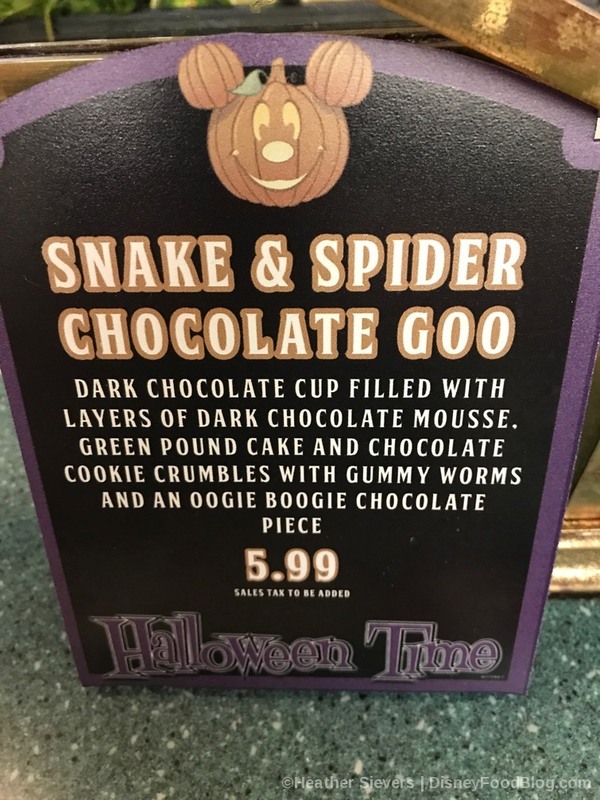 At French Market in New Orleans Square, you’ll find Snake & Spider Chocolate Goo — an this one is goo-d! 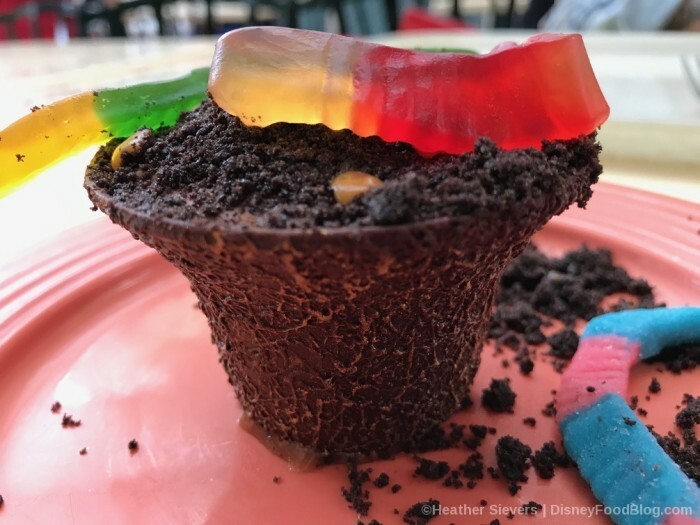 It seems like a straightforward worms-and-dirt dessert at first glance, but it’s so much more once you dig in. Oogie Boogie waves menacingly (in white chocolate form) from the top of this pile of chocolate goo-dness. You’re also getting several gummy worms, which are fruity and chewy and creepy. 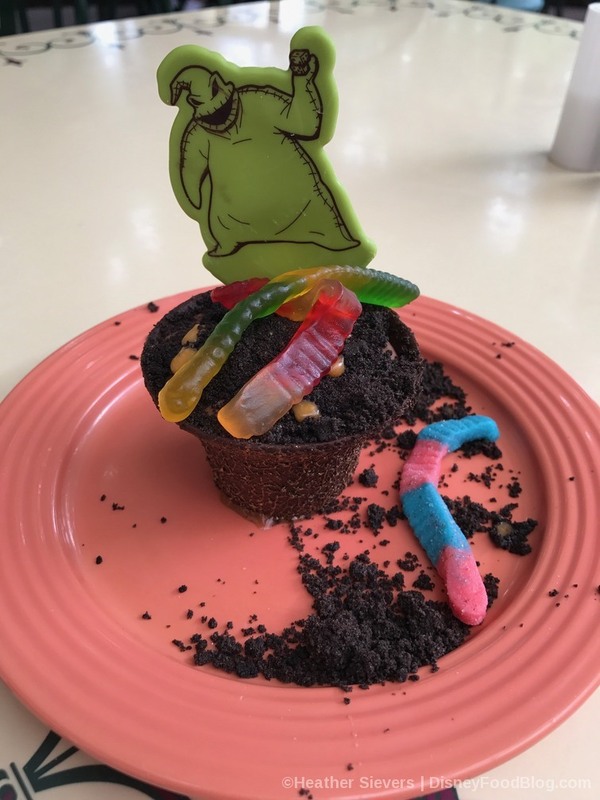 There is a ton of chocolate cookie crumble on there to mimic the dirt. Because inside this edible chocolate vessel is layers of dark chocolate mousse and — wait for it! 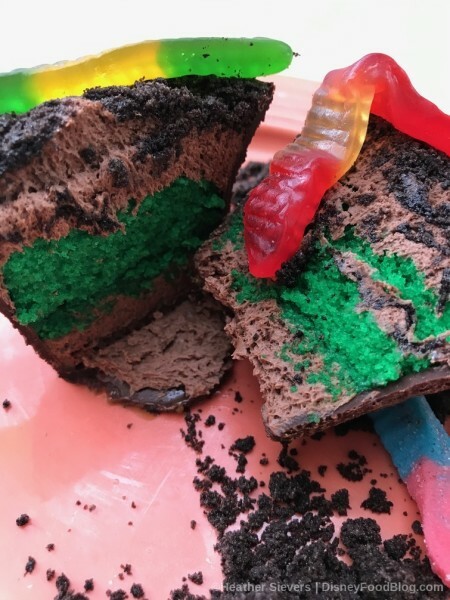 — bright green pound cake! The color contrast is so fun! This is a great dessert for picky eaters (or youngsters!). Snake and Spider Goo Inside! 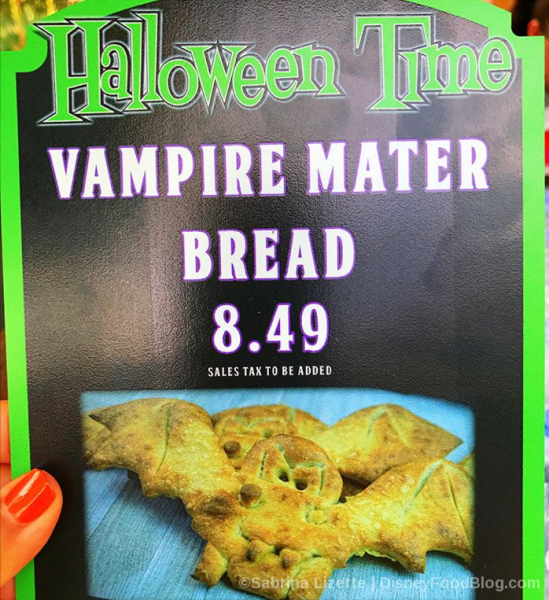 Now, those of you who follow Disney Food Blog on Instagram can’t have missed our endless musings on the glory of Groot Bread that was available for the Summer of Heroes, so it will come as no surprise that we were able to find a suitable Halloween substitute with Vampire Mater Bread! As much fun as Haul-O-Ween in Cars Land is, we’ve got some more treats to check out! Drift your ghostly self over to the Mint Julep Bar in New Orleans Square in Disneyland to grab this year’s Seasonal Mickey Beignets. You’ll recall that the Mint Julep Bar offers just a couple of specialties: their recently-revamped Mint Julep and Mickey Beignets. 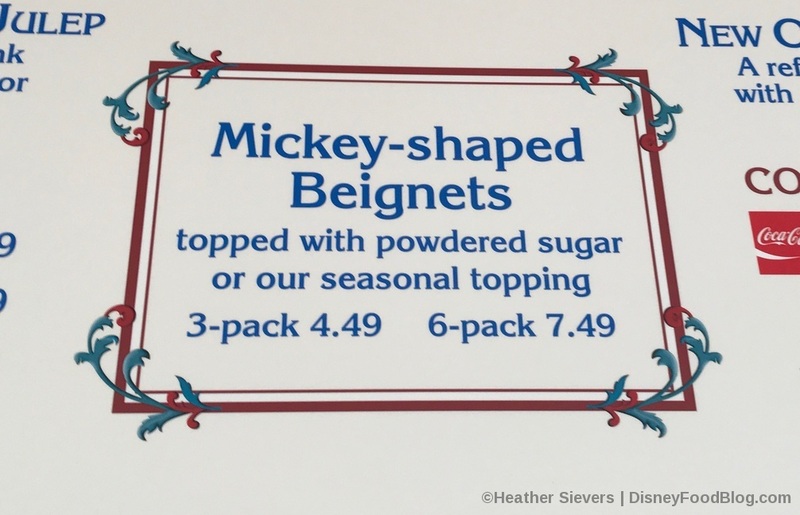 In years past, the Halloween seasonal beignet has been butterscotch — but not this year! Instead, the seasonal topping is Dreamsicle. They’re your traditional Mickey Beignets (three or six to a bag), dusted with orange-tinted, orange-flavored sugar and complete with sugar stars. 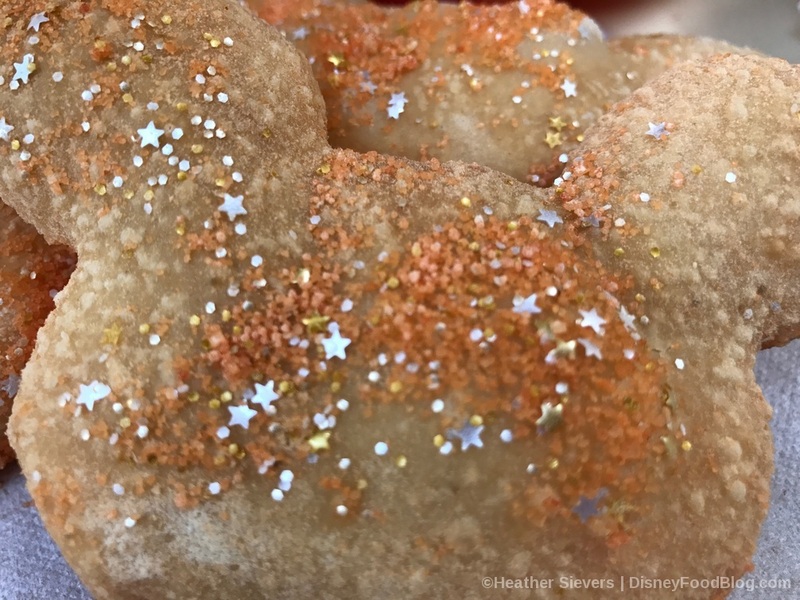 We’ve seen flavored sugar at Disneyland before, like for the anniversary celebration of Pirates of the Caribbean, where churros were coated in gold, lemon-flavored sugar. Heather loved this iteration of one of our favorite Disneyland snacks. 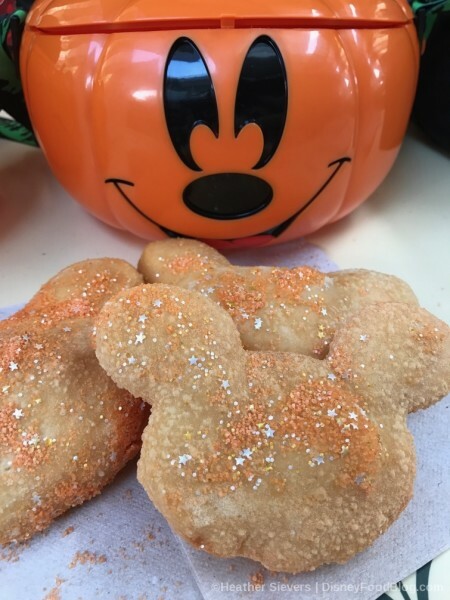 They are still powerfully sweet, although the sugar here is texturally different from the traditional powdered sugar (which is still available throughout the season, BTW!). Inside as always, the beignets have lovely air pockets and soft dough. Just right for the fall. And spring, summer, and winter, for that matter. 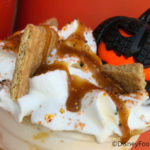 If you’re in the mood for pumpkin-everything, Jolly Holiday has some always amazing options. The Pumpkin Muffin is a guest favorite, with a dollop of cream cheese frosting on top and terrific texture as well. 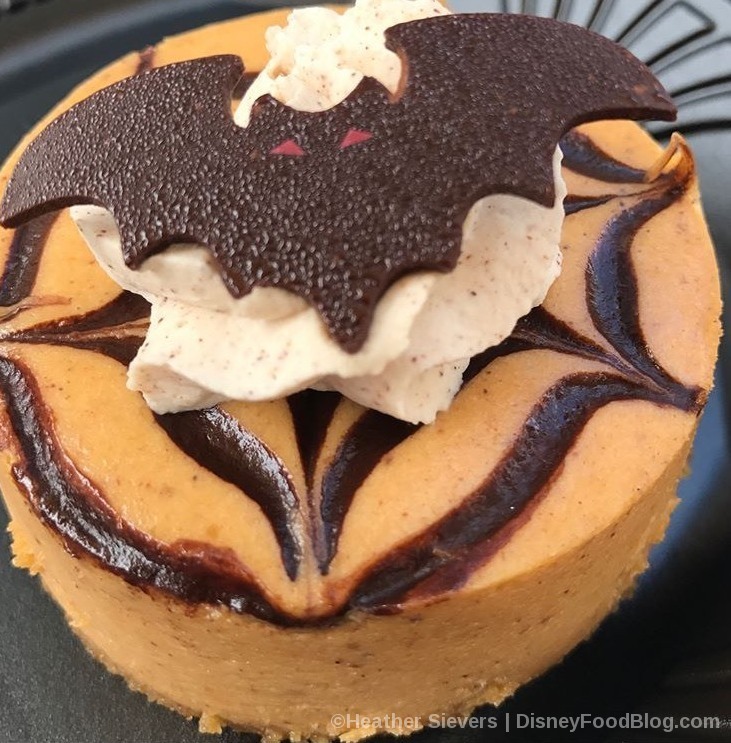 The Creamy Pumpkin Cheesecake is another perennial favorite, with this season’s version topped with swirls of chocolate and a festive chocolate bat. 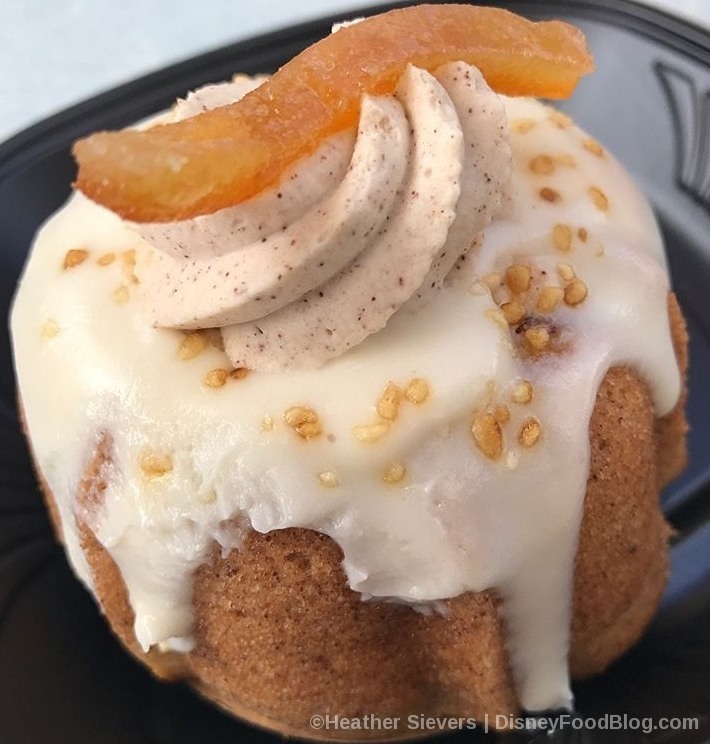 If you want some autumnal spice without the pumpkin, you’ll fall for the Spiced Bundt Cake. 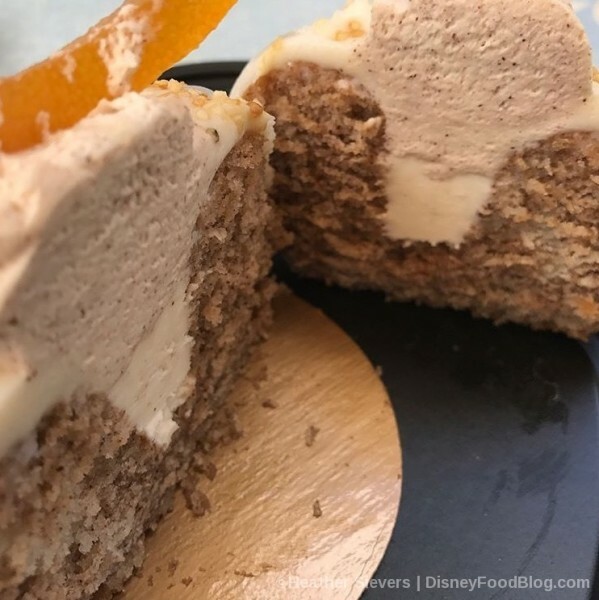 It’s indulgent, with glaze and frosting, candied orange peel, and dense cake. Inside is even more frosting and glaze. 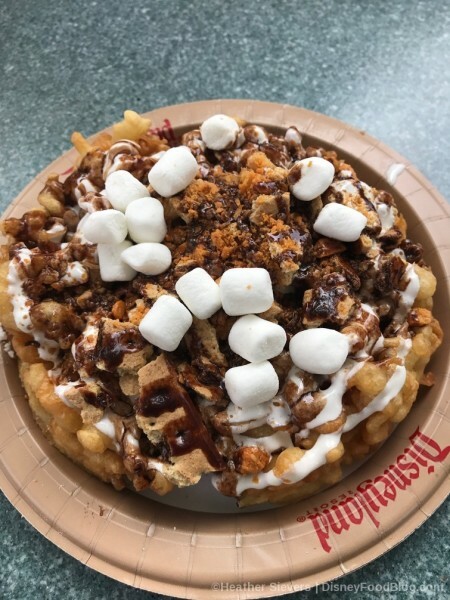 Funnel cakes are essential Disneyland eats, and Stage Door Cafe is serving up a truly exciting option: Campfire S’mores Funnel Cake. Holy awesomeness overload, friends! 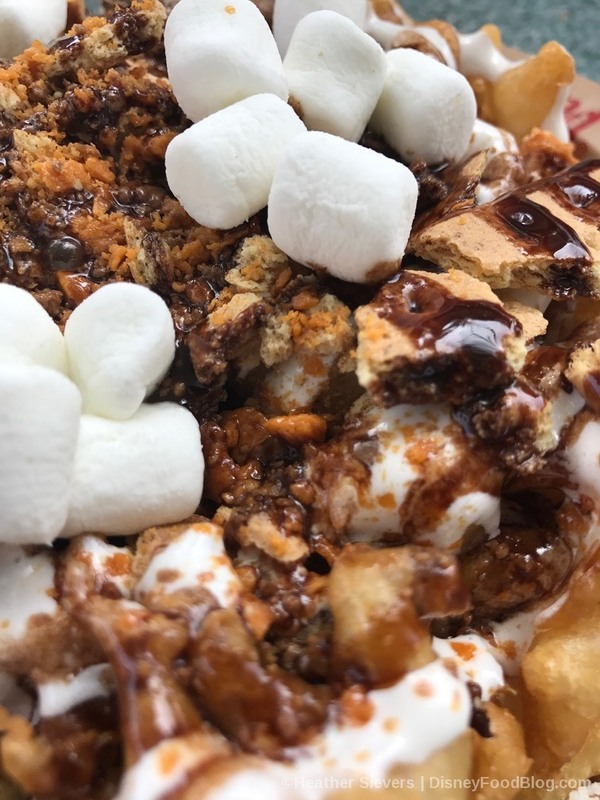 This iteration of our favorite fried dough treat is covered in a chocolate-chile ganache, toasted marshmallow sauce, mini marshmallows, graham cracker crumbs, and crushed peanut butter candy. The subtle heat from the ganache is a nice surprise mingling amongst the straight sweetness of the other components. 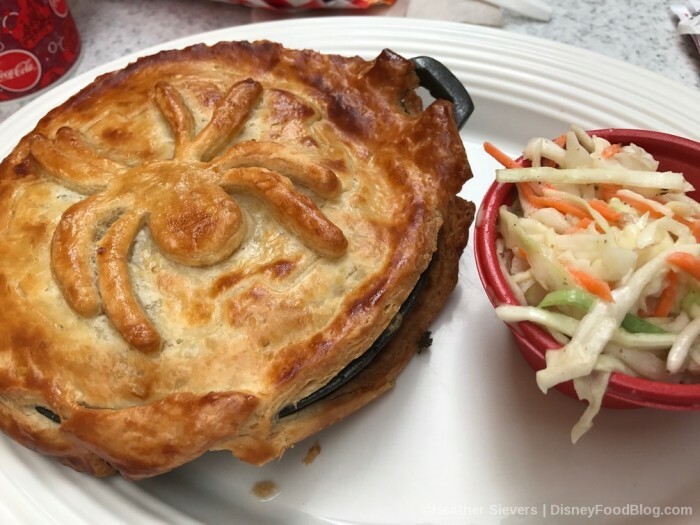 Heather raves about this one, so if you’re in the realm of Stage Door Cafe, do yourself (and a cohort — you’ll need to share!) a favor and get this! 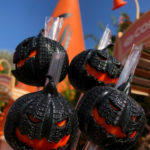 There’s no event too small or too big for a Disney Cake Pop, and the Halloween version is perfectly sinister! It’s a Black Rose Cake Pop, which is sure to give you all kinds of creepy feels. You can find these at the Candy Kitchens all over the park, and it’s only available in chocolate cake. If you’ve heard the spectral whisper of cupcakes and cookies, you can find Halloween-inspired ones in the park as well. The Headless Horseman Cupcake has Oreo cookie crumbles and some ghastly red drizzles. 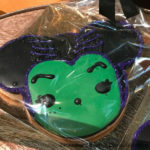 The Bat Cookie, on the other hand, is a shortbread in one of the holiday’s quintessential shapes. 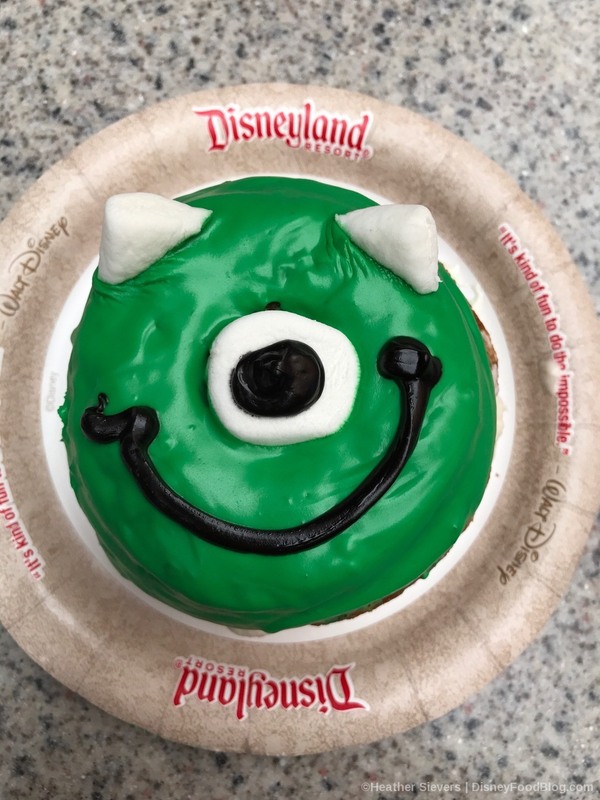 If you can’t leave Disneyland without a candy apple — friend, have they got two options for you! 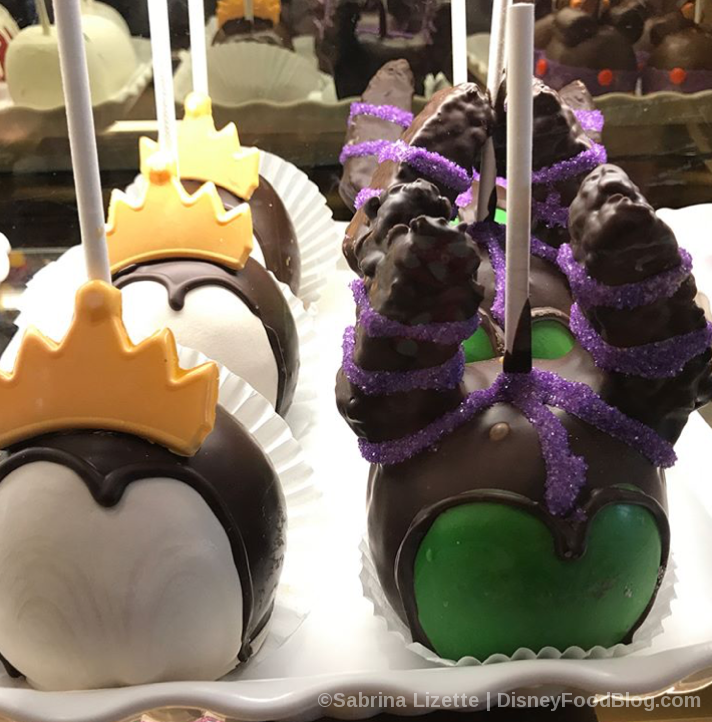 The Evil Queen and Maleficent have been immortalized once more this year! And in case you don’t get over to California Adventure for that Spoke-y Cone Macaron (or if you just try to avoid candy corn, like some of us) or you’re not a big fan of Mummy Macaron Ice Cream Sandwiches, there’s an equally festive option in the sweet shops in Disneyland: the Mummy Macaron. 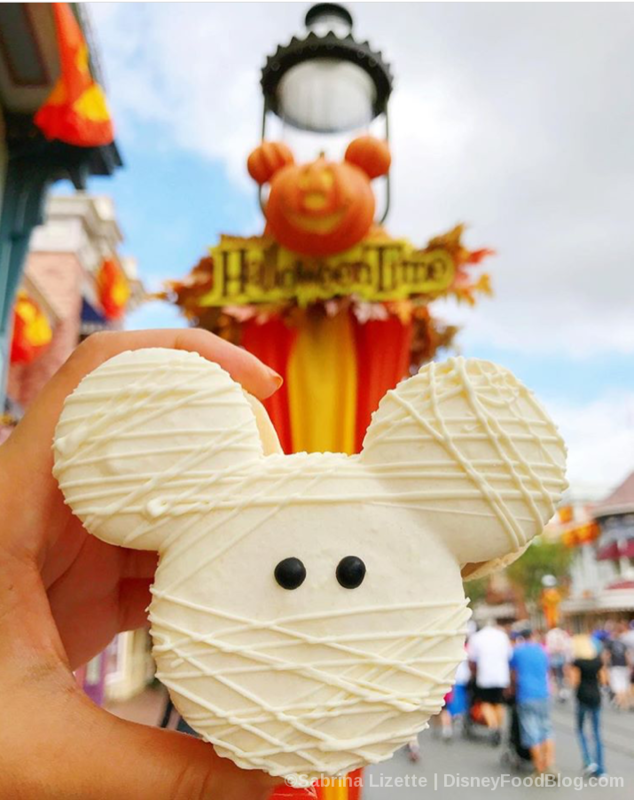 It’s completely picture perfect, with white chocolate strands wrapping a Mickey-shaped macaron. Simply AWESOME. 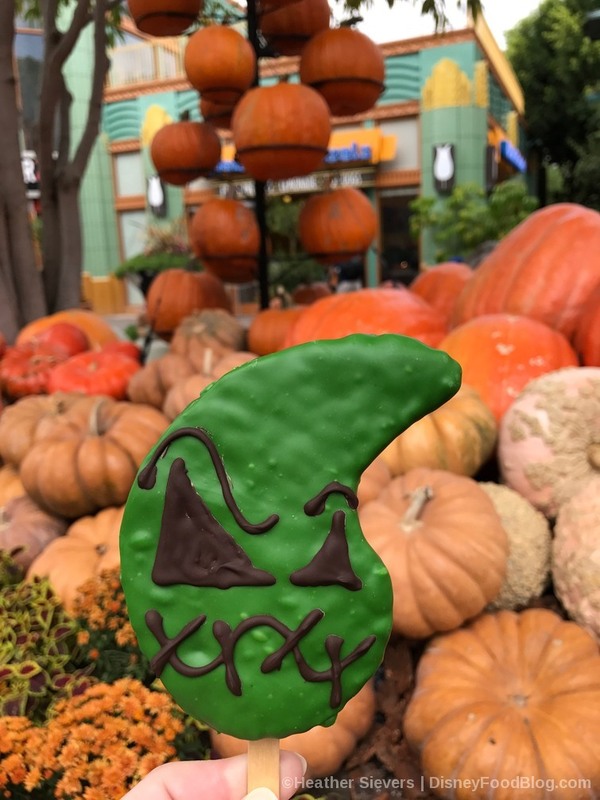 If you can’t get enough of Oogie Boogie, there’s an Oogie Boogie Krispy Treat for you! 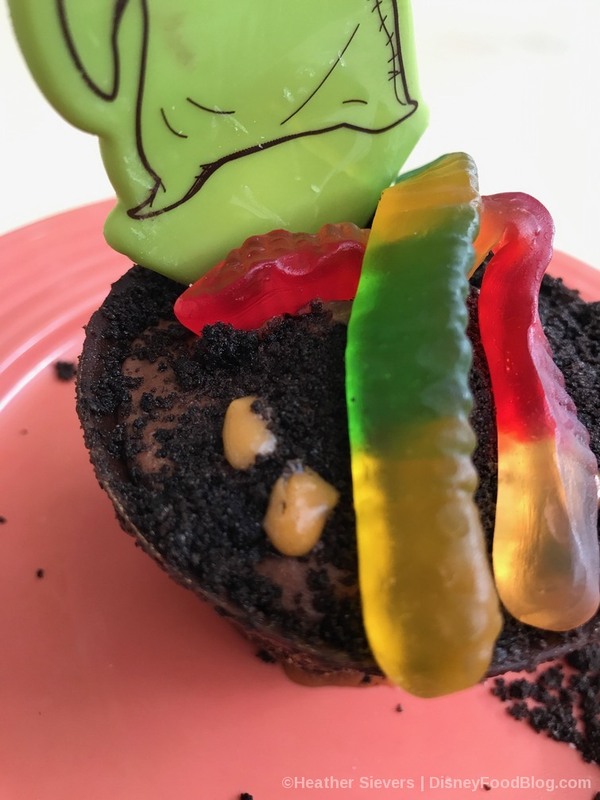 He’s mean, he’s green, and… he’s edible! 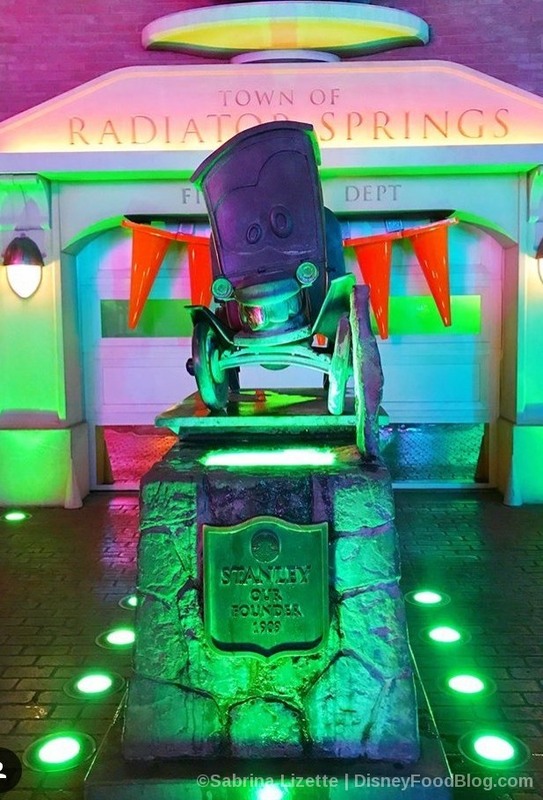 You’ll find him in various locations throughout the parks. 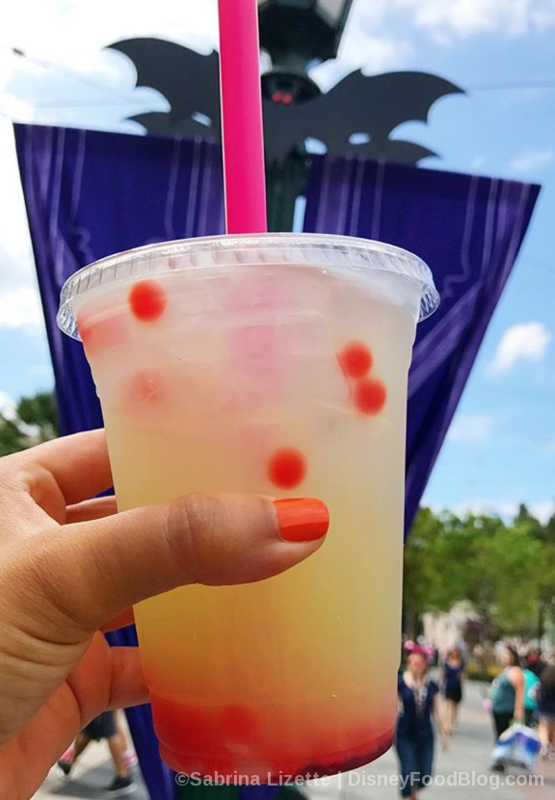 Sabrina also scored a delicious cup of refreshing Green Apple Spell Lemonade with Cherry Drops at Smokejumper’s Grill in Disney California Adventure. The flavor combination of green apple, lemon, and cherry is terrifically sweet and sour. 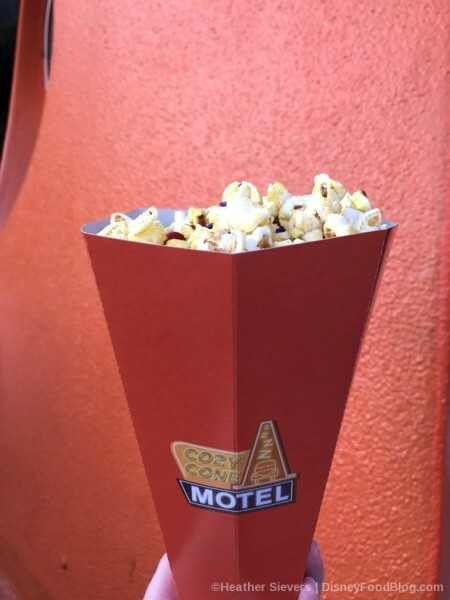 Okay, we’re starting off with this year’s Annual Passholder Exclusive Popcorn Bucket. 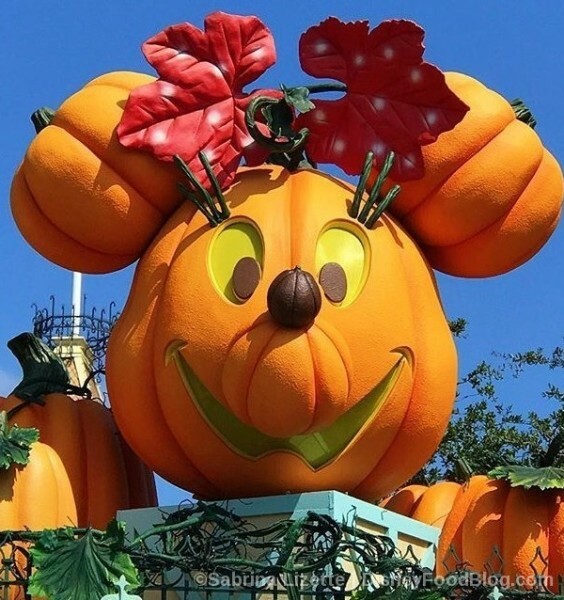 But even if you don’t have a Disneyland Annual Pass, it’s so funky this year you’ve just GOTTA check it out. The sign doesn’t shed any light on things other than the price and the refillable details (unlimited for a buck through October 31st!). YES!!!!! 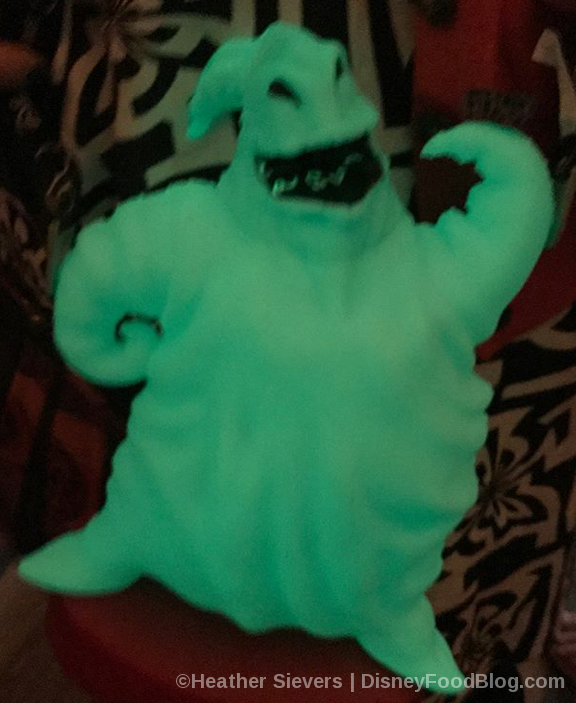 And, my friends… Oogie Boogie GLOWS IN THE DARK (!!!). 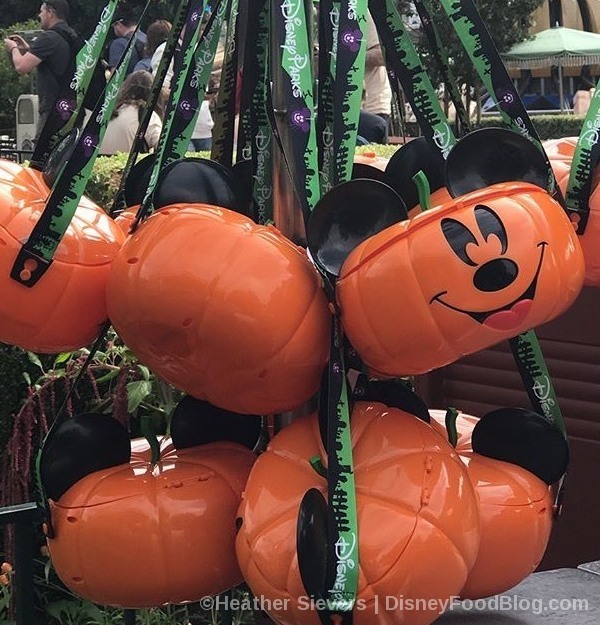 And if you’re not an Annual Passholder, you’ve still got a Perfectly Pumpkin-y Popcorn Bucket option with the seriously cute Pumpkin Mickey! Of course, what’s Halloween anywhere without COSTUMES?!? This year, we present to you Daisy Duck. Perfectly bewitching as always, no? Folks, the holidays at Disneyland and Disney California Adventure are starting off with a bang! And you’ve got until the Big Day — October 31st! — to try all the Halloween tricks and TREATS!!! 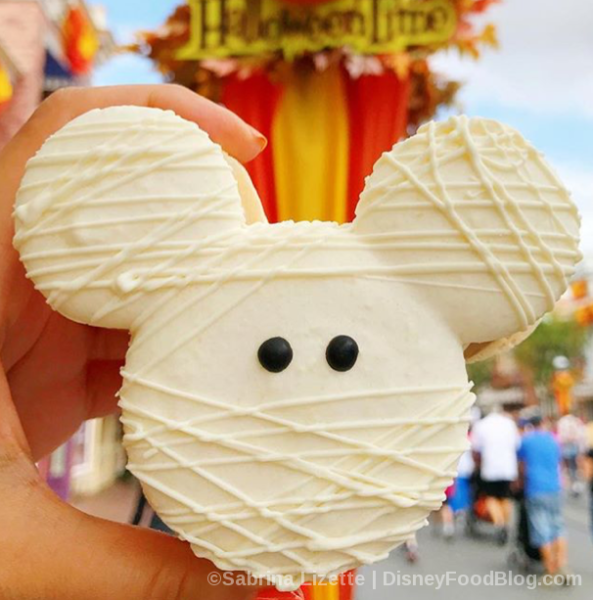 Let us know your favorite holiday-inspired treats from the Disney Parks! Thoroughly enjoyable, extensive report. I enjoyed it immensely. Thank you to everyone who worked on it! 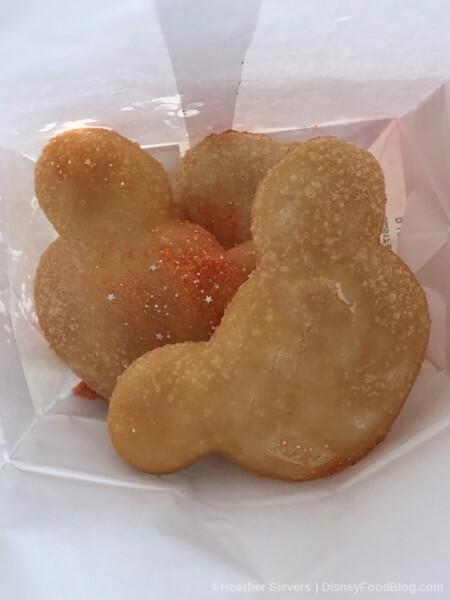 I live in NY, I only get 8 time off days per year at the job, AND I can’t even eat popcorn….but I *STILL* want to get an annual pass just so I can get that darn popcorn bucket!!! Perhaps we all want what we can’t have but I SWEAR the Disneyland food trump Disney World food any given Sunday. 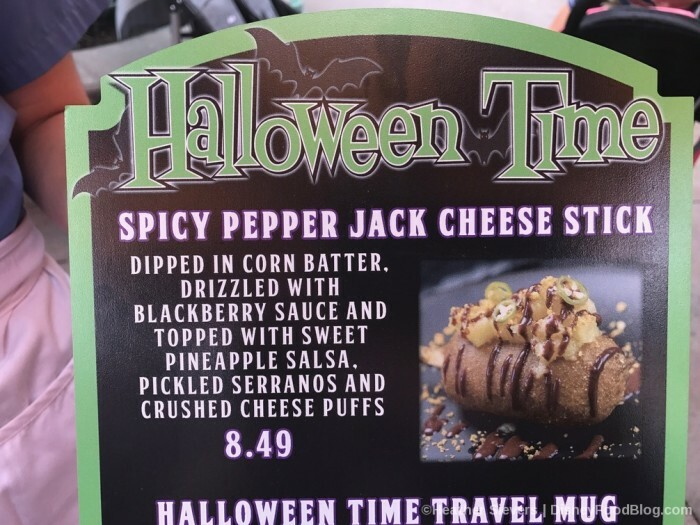 I wandered Magic Kingdom last night for a Halloween treat and there is NOTHING! I know, Kathy. I agree with you. 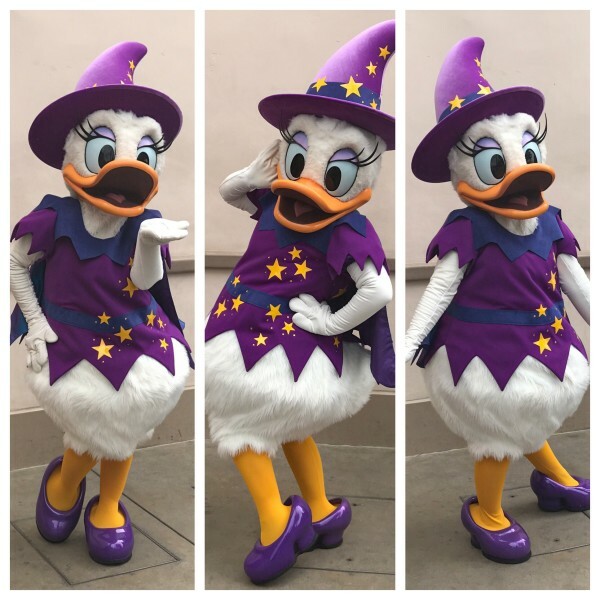 I don’t even bother going to the World anymore at Halloween time, but I’m heading to DLR with my family on 10-6 through 10-15. How many pumpkin waffles can one family eat? That seems to be about all we’re offered at WDW. They’re at Sleepy Hollow. Check there! I can’t wait to try all these fantastically spooky treats! However, the Oogie Boogie popcorn bucket isn’t AP exclusive. 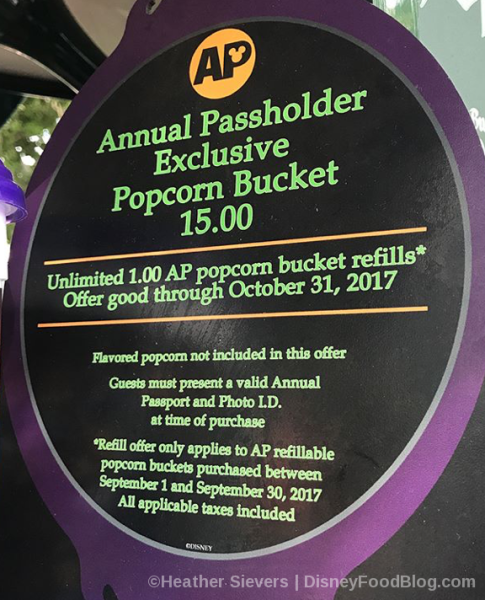 The AP refillable one has a purple lid and villains on it and is good to refill through October 31. I don’t see any lighted drink cubes on this post. Have you heard of any Halloween cubes for this year? Thanks in advance! 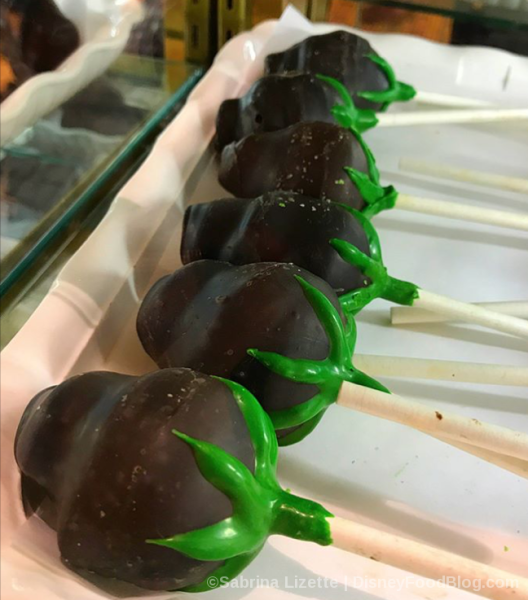 Jessica Block — Yep, there are green poison apple drink cubes this year. 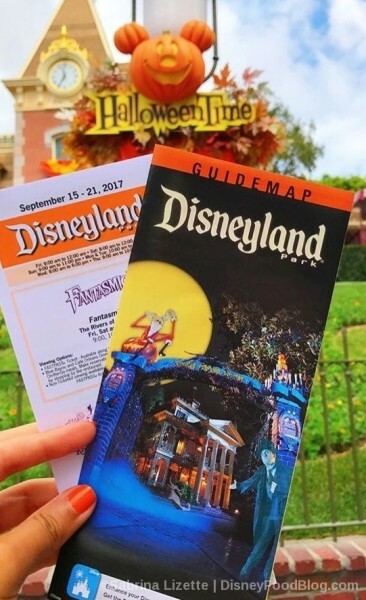 I usually attend MNSSHP at Disney World, this will be my first time attending at Disneyland. In regards to the special Halloween food – will they only be served during party time on party dates like at World? 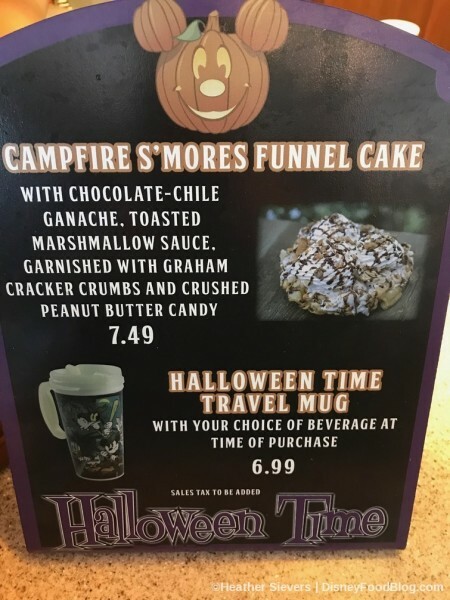 Or will they be available everyday until Halloween? Thanks! I miss the pumpkin beignets. 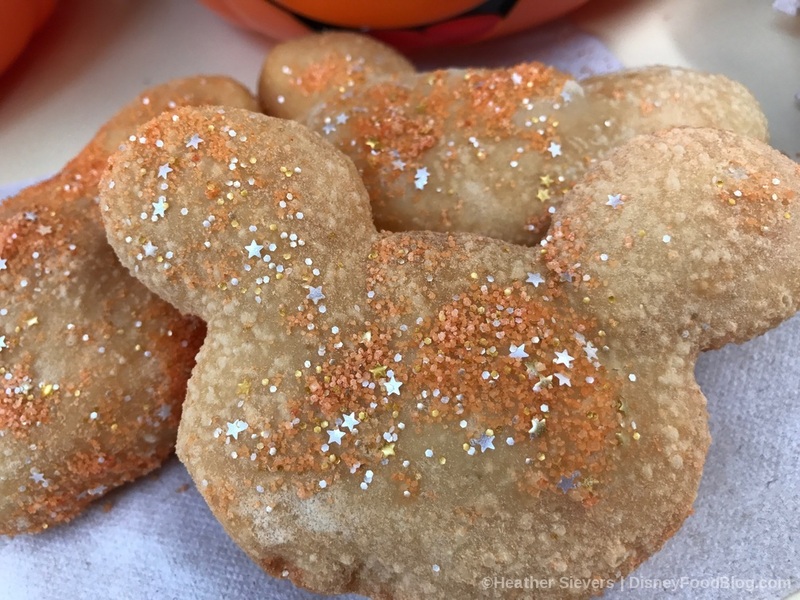 While the orange sugar dusted ones are festive, I think they should offer both kinds. 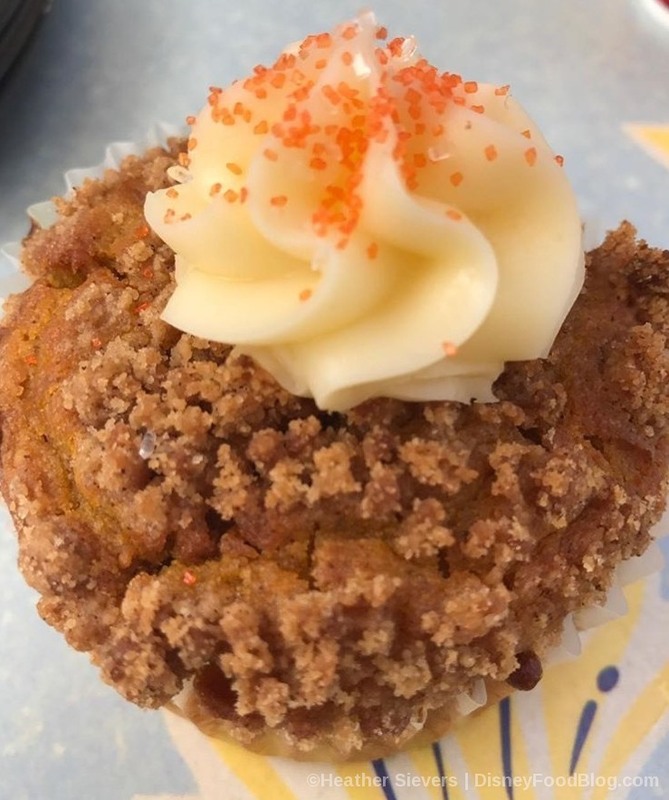 A muffin and a cheesecake is just not enough pumpkin deliciousness to go around! 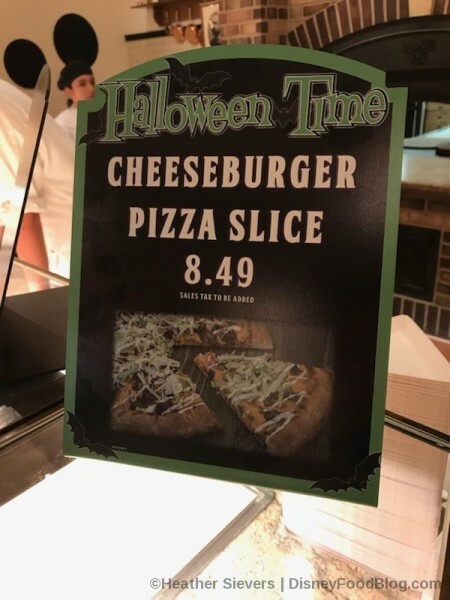 Is the Cheeseburger pizza only around at Halloween time?